This story isn’t exactly folklore—yet—but it should be. Maybe someday, given the way stories spread and change, it will be. For now, this is the story of the small village of Nagoro, Japan whose population has dwindled drastically, going from 300 residents to 30. There are no children in the village anymore. It’s in the process of dying, like so many villages in Japan whose overall population is in decline. Tsukimi Ayano saw the profound change when she returned to her village to care for her father fifteen years ago after living in Osaka for many years. Now sixty-seven, she’s one of the youngest people left in Nagoro. About ten years ago, she planted some seeds and needed a scarecrow to keep the birds away. She dressed it in her father’s clothes—with his permission—and noticed that the neighbors said hello to the doll. So she made more dolls, repopulating the village gradually, some representing people who had died as a form of remembrance, like her own grandmother, some made up from her fertile imagination. She’s repopulated the now-closed school, filling it with students and teachers, making it as she remembered it from her own youth. She makes these dolls from joy, she says, not from loneliness or despair. They just make her happy. 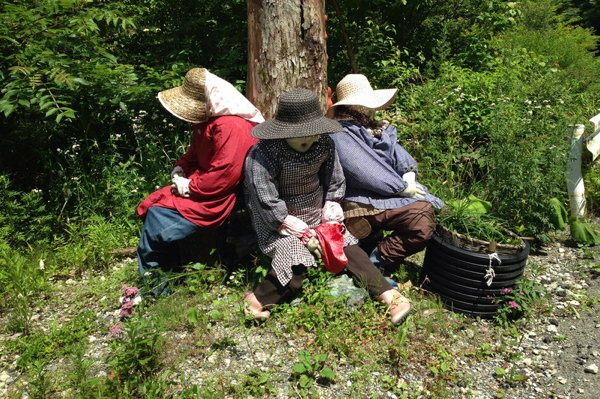 The tourists have found Nagoro, and some of the neighboring villages have asked her to make scarecrows for them. Some people find them charming, some find them creepy, but such is the way of the world. Tsukimi Ayano says she will keep on making them as long as she is able to. You can read the entire NPR story here and see more pictures of Ayano’s work. You are currently browsing the archives for the dolls	category. WordPress 5.1.1 and delivered to you in 0.842 seconds using 30 queries.